Coat baking tray with olive oil. Add John Dory Fillets to the baking tray. Cut leeks into slices. Peel sweet potatoes into ribbons. Roughly chop kale. Drizzle tamari sauce, sesame oil, and honey over fish. Sprinkle with chili flakes and season generously with salt. 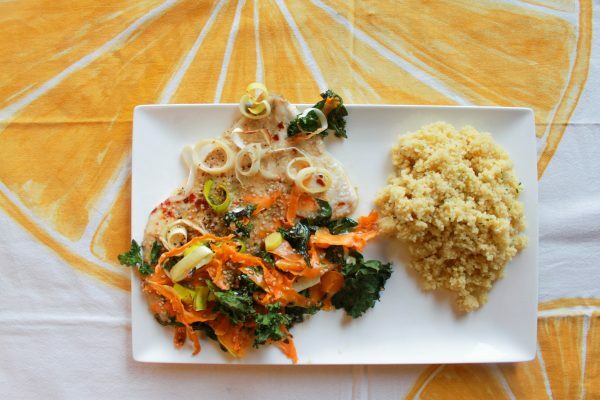 Arrange the sweet potato, kale, and leeks around the fish. Light coat the sweet potato, kale and leeks with a bit more sesame oil and a sprinkle of salt. Sprinkle sesame seeds over everything. Bake in the oven for 15-20 minutes, until kale is crunchy and fish is cooked through.